SIRIUS 3RV circuit-breakers are compact, current-limiting circuit-breakers. They ensure safe shutdown in the event of a short-circuit and protect loads and plants against overload. Furthermore, they are also suitable for manually switching loads under field conditions and safely isolating the plant from the main power supply when maintenance work or modifications need to be undertaken. Just like all SIRIUS devices, the circuit-breakers are suitable for side-by-side mounting up to 60 °C. In addition to the usual CLOSED/OPEN circuit-breaker positions the TRIPPED position is also indicated. 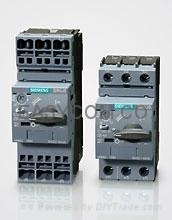 SIRIUS circuit-breakers can be connected easily and without any wiring to the SIRIUS contactors and soft starters through a link module. The clear, structured range is electrically, mechanically and optically harmonised to the other families of SIRIUS devices – contactors,soft starters and overload relays. Furthermore, the four sizes cover a current range up to 100 A. This corresponds to a power range up to 45 kW at 400 V AC. The SIRIUS Soft Starters 3RB and 3RU1 are certified according to ATEX and thus suitable for application in potentially explosive areas.